rightful place to help her people. the age of eighteen, Cleopatra married her younger brother, with the age of 12, Prolmey XIII because of the Egyptian law, which called for any female ruler to have a consort who was either a brother or son in order to rule Egypt together. 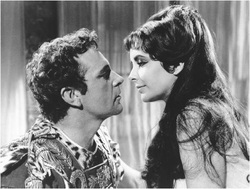 The age difference seemed to be to Cleopatra’s advantage and she ruled alone for approximately three years. She was then exiled for ignoring her younger brother’s right to rule along her side, leaving Prolemy VIII in charge of the entire Egyptian Empire. Pompey fled to Alexandria, he was murdered by the order Prolemy VIII. Caesarion, to whom he never claimed as his own out in public. As a Queen, Cleopatra did what she could to learn the Egyptian language since she was taught and was raised to speak Greek. When she finally learned the Egyptian language, she chose to only speak that language. During her rule, Cleopatra maintained peace and stability and prosperity to the Egyptian empire when they were bankrupt because of the recent civil war. When Julius Caesar was assassinated in 44 BC, a rival emerged between Marc Anthony and Octavian, the adopted son of Julius Caesar. empire to Cleopatra VII, the Queen of the Egyptian Empire because she had him under a spell. Octavian continued to instigate a war until another Civil war broke out. Octavian was not fully satisfied with only the deaths of Cleopatra and Marc Anthony and had Caesarion strangled to death. Cleopatra was the last pharaohs that ended the Cleopatra Dynasty. Marc Anthony once wrote a segment down about what impresses and what mainly attracts him about Cleopatra. "For (as they say) it was not because her [Cleopatra's] beauty in itself was so striking that it stunned the onlooker, but the inescapable impression produced by daily contact with her: the attractiveness in the persuasiveness of her talk, and the character that surrounded her conversation was stimulating. It was a pleasure to hear the sound of her voice, and she turned her tongue like a many-stringed instrument expertly to whatever language she chose...." she knew what she was capable of and how she would men to allow her to do something. Cleopatra struggled through so much and for the most part it was all so chaotic but from the beginning her mind was set to take her rightful place on the throne as queen. Overall she fought for her country and when she ruled her empire and country was at its greatest peaks after her father’s death. Her inner strength to overcome all the chaos and get as far through her goals as she did makes you realize that just as men, women are powerful, the only main difference is how we approach a situation and how we make use of our power.